﻿After 36 years of working with and forming intense loving bonds with non-human animals, I decided to give my heart a rest. 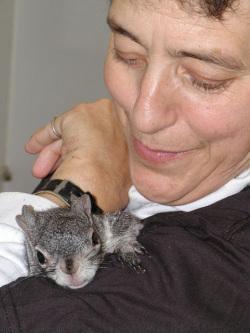 I retired from my last job as a clinic tech and caregiver at a wildlife rehabilitation center. I was certain my new career path would be telling the stories about the animals I loved, and teaching others what they taught me. I share these experiences in a slide presentation, "Kinship With Animals" and have written a small book, "A Wild Life" about some of my incredible experiences with native wildlife at a rehabilitation center. My goal in life is to help others understand that our non-human animal kin are more like us than not. Living a trans-species life is relating to animals on their terms keeping in mind their capacity to feel deeply and have a sense of intelligence many of us do not recognize. Check out my latest book under "book" tab!